Each volunteer is a key component of The Tech's mission to inspire the innovator in everyone. We do this through exhibits, content and programs that encourage hands­-on learning. Volunteers are required to attend a 90­-minute orientation session and, for those who volunteer in our galleries, a three­-hour museum exhibits training session. We offer these sessions on the second and fourth Saturday of each month. Want to learn more? 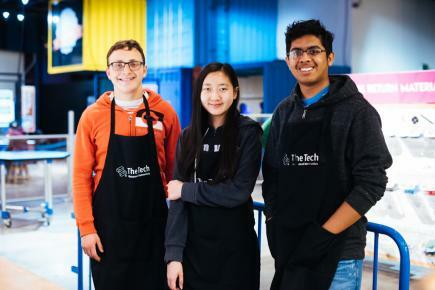 Send an email to volunteer@thetech.org. Adult volunteer applications are now open! Discounts in The Tech Store, The Tech Cafe and special-event IMAX films. Questions? Send an email to volunteer@thetech.org. The Tech is looking for outgoing, enthusiastic volunteers who have a comfortable command of English and are 18 or older. Knowledge of science and technology isn't required, but the desire to help inspire the innovator in everyone is! Weekday exhibit interpreter: These volunteers engage and interact with our guests and interpret exhibits and programs. There are two shifts: 8:30 a.m. to 1 p.m., and 12:30 to 5 p.m. We ask for a commitment of two shifts per month for a minimum of six months, though many of our volunteers end up staying with us for longer. Evening events volunteer: Interested volunteers must be at least 21 years old and be available to assist us after 5 p.m. We ask for a minimum commitment of two events per month. Guest greeter: These friendly and outgoing volunteers greet guests as they enter the museum. The shift is Monday through Friday from 9:30 a.m. to 2 p.m. Volunteers for this position must be able to stand for extended periods. We ask for a commitment of at least two shifts per month for a minimum of six months. Done-in-a-Day corporate volunteer program: We encourage corporations to bring groups of two to 20 employees to engage young people in science, technology, engineering and math activities on the museum floor. We have half-day (4-hour) and full-day (7-hour) activities. Inquire today by contacting Talance Orme at torme@thetech.org. Priority for special activities and dates is given to our corporate partners. All positions are full at this time. Please use the form below to join our waitlist. You may add your name to our waitlist up to three months before your 15th birthday. All internship positions have been filled at this time. Please check back soon for future internship opportunities.